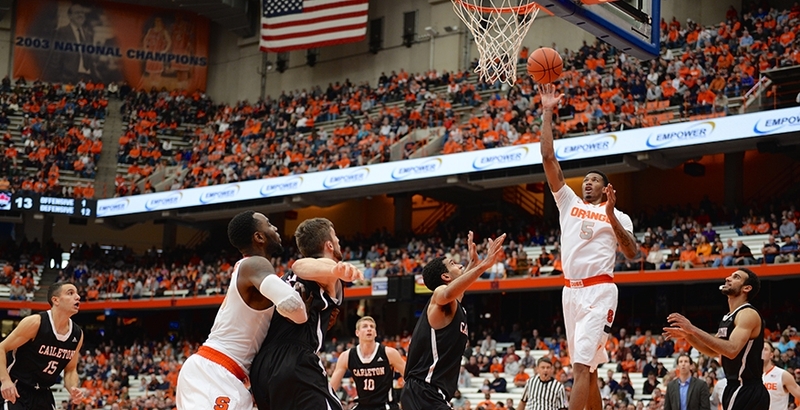 Chris McCullough (5) drives to the hoop against Carleton. The freshman had 14 points. SU mounts a second-half comeback as new offensive weapons emerge. After a disappointing conclusion to a once-promising 2013-2014 campaign, standout performances by two of No. 24 Syracuse’s marquee freshmen gave Orange fans plenty of reason to celebrate again Sunday afternoon at the Carrier Dome. SU trailed by double digits early on, but seized momentum in the second half behind the play of Kaleb Joseph and fellow frosh Chris McCullough en route to a hard-fought 76-68 victory over Carleton. Rakeem Christmas (25) throws down a thunderous dunk against Carleton. 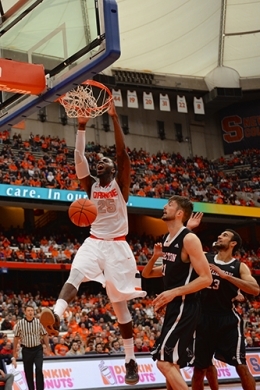 “I thought the two freshman played well,” SU head coach Jim Boeheim said. “I thought they did everything you could ask of them. Kaleb especially was really good." With 19 points, four assists, and four rebounds, Joseph played at a level far higher than many expected. Calm, cool and collected, the freshman displayed a soft touch while shooting an impressive 78 percent from the field. He attacked the rim, showed great floor vision and most importantly turned the ball over only once. For his first game in the Dome, Joseph did just fine. With the departure of Tyler Ennis, the Orange will need to lean on its point guard throughout the season. However, the former Cushing Academy humbly standout downplayed his stellar debut. When asked to grade his performance, he refused. Despite a sluggish first half in which the Orange shot a paltry 30 percent and mustered only 30 points, the offense soared in the second half, resembling a well-oiled machine. Sophomore Ron Patterson proved to be a spark plug off the bench, providing 15 points in as many minutes and nailing four shots from beyond the arc. Slightly overshadowed by the stellar play of his fellow freshman, McCullough did more than impress in his first game. Chipping in 14 points and six rebounds, he proved to be a force in the paint, even stepping out to connect from three-point range. That versatile skill set that could prove valuable this year for the Orange. “It’s a good feeling for us. That’s a great team,” said McCullough in reference to Carleton, one of the premier basketball programs in neighboring Canada. With a feel-good win in the books, many are hoping for a start similar to last year’s 25-game undefeated streak. But based on Joseph’s strong start and impressive performances across the board against a tough opponent, at least one thing is clear. Basketball is back in Syracuse.